Next up, a couple of Laxmikant Pyarelal scores that, to be honest, aren't that interesting. (What, again?) Well, 'Krodhi' is moderately OK I suppose; I'm at least appreciating the album slightly more now than I initially did. 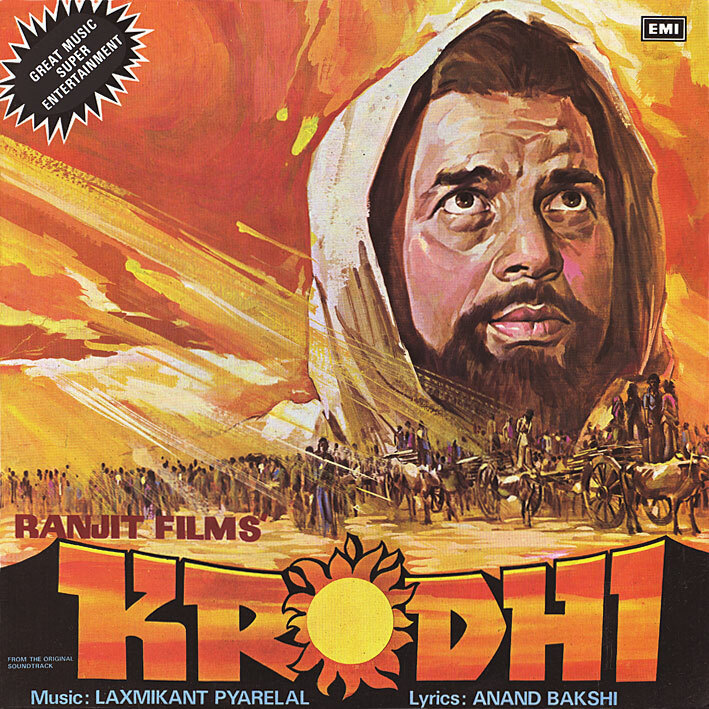 Still lots of things I don't like about it, but one I do: The mini epic 'Woh Masiha Aaya Hai' has a fair bit of good stuff contained within its 10 minutes - an atmospheric intro, melodramatic breaks, nice orchestrations, a cool beat, loads of Morricone-isms - so worth a listen at least. Elsewhere there's the odd nice detail, and 'Ladki Walo' is catchy in its way, but on the whole this is nothing special. man, PC, who ever you are! You are great! I saw this movie and was moved by it. Fantastic movie. I was especially moved by the Mannadey song. Great treat, and was trying to find it desparately. Thanks to you now, I have it! Keep up the good work.